Nuclear magnetic resonance spectroscopy, or NMR spectroscopy, is a powerful technique that uses the magnetic properties of atomic nuclei to elucidate the chemical and physical properties of the atom or its molecule. The nuclei of certain atoms, such as 1H or 13C, align themselves with magnetic fields in nuclear energy levels known as ‘spin states.’ When molecules are placed in an external magnetic field and irradiated with radiofrequency (RF) waves, certain atomic nuclei present in the sample absorb energy. These RF waves flip nuclei from one spin state to another. If the RF is turned off, the nuclei relax, releasing energy in the form of RF waves, which are measured as the decay in signal intensity over the course of a few seconds. The time domain of these signals is converted to the frequency domain to produce a spectrum, what we normally think of as the output of an NMR experiment. But what can you actually do with NMR? Traditionally, the technique has been used to identify molecules and determine their 3D structures. It can certainly do this; however, the actual range of applications for this technique is much wider. With metabolomics approaches, you can quantify biofluids and tumor and tissue extracts. Binding events, even very weak ones, between two proteins or between protein and DNA can be detected. You can also determine the stoichiometry of these binding events. Trying to compare a wild-type protein to its mutant variant? 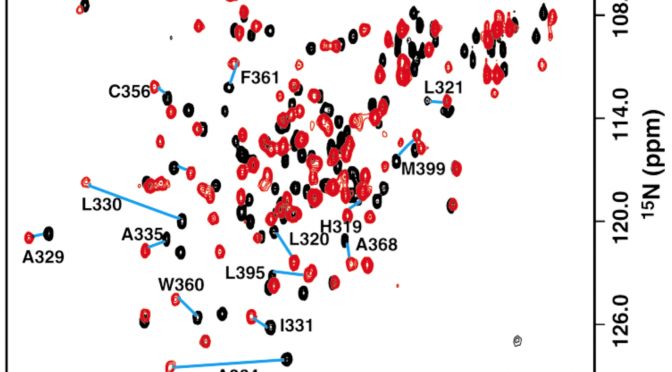 Characterizing the active site of your protein of interest? NMR can handle both of these tasks, and measure dynamics of the protein in its active conformation as well. To that end, NMR can also be used in live-animal imaging. If you’ve ever had an MRI, you may know that the technique is actually based on the science of NMR! Figure 1. 1H-15N 2D spectrum of BPV-1 E2 DBD (310-410). Resonances of the DNA-bound protein (red) show chemical shift differences relative to the DNA-free sample (black) (taken from Veeraraghavan et al. Biochemistry (1999) 38: 16115-16124). What facilities does Tufts have for NMR spectroscopy? The Tufts NMR Center currently has 3 NMR spectrometers, all located in an environmentally controlled laboratory on the 6th floor of M&V. The Bruker DRX-600 spectrometer used for structure determination of large protein domains and small proteins, as well as metabolomics experiments. It offers the highest resolution and sensitivity of the three instruments. 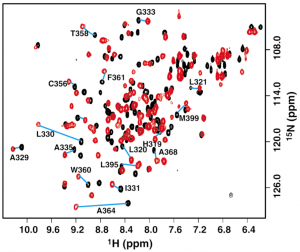 The Bruker AMX-500 spectrometer is good for examining peptides and small protein domains. The Bruker DPX-300 spectrometer is useful if you need to check the identify or purity of products of organic synthesis. The system is set up to look at nonstandard nuclei, such as 11B. The NMR Center is also in the process of upgrading the Bruker DRX-600 by replacing the console electronics. With this upgrade, features such as non-uniform sampling and cryogenic cooling, which can double the sensitivity of 2D and 3D experiments. Other upgrades to the hardware will increase the reliability, ease of use, and speed of data collection for this system. Users will be able to study the structure and dynamics of proteins and protein complexes with high molecular weights and limited solubility, which is limited by the current sensitivity of the instrument. Information about the spectrometers available in the NMR Center can be found at the following website: http://medicine.tufts.edu/Faculty-and-Research/Core-Research-Facilities/Tufts-NMR-Center. With questions or for help planning an NMR experiment, please email Dr. Jim Baleja at Jim.Baleja@tufts.edu. If you are interested in reading more about NMR spectroscopy, Bothwell and Griffin wrote a straightforward but in-depth article (Biological Reviews (2011) 86: 493-510).